Credit cards are one of the most popular and preferred medium of payment for all types of transactions. And when we say credit cards, there’s only name in the business – Visa. Well-known in the industry, Visa connects consumers, businesses, banks and governments worldwide and transforms the way people transact their payments with the use of digital currency instead of cash and checks. Establishments around the world have switched to digital currency to lessen the costs and maximize efficiency, and binary options brokers are not exempted from this issue. You too, as our valued client, can make transactions using Ikko Trader Visa credit cards. Thru Visa’s innovations, consumers have more choices when purchasing items. You can pay thru debit cards, prepaid or simply using your credit cards. With Ikko Trader Visa, you can deposit funds to your Ikko Trader trading account in a faster and more efficient way without compromising security. As long as you have an active Visa credit card, you can use this to make transactions with Ikko Trader whenever you want it. As a result, trading becomes smooth and seamless. Depositing funds and cashing out your winnings becomes more convenient and secure. 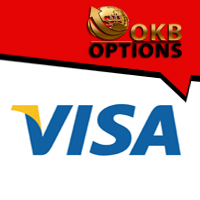 When making a deposit, choose Ikko Trader Visa as your method and proceed. Enter the necessary details shown in your screen including your credit card number. Note that, first-time depositors only need to enter their card details once as this will be stored in our server. Then, follow the onscreen instructions. Just like purchasing an item over the Internet, you can easily use your credit card to make a deposit. Withdrawing your funds can also be done using your Visa credit card. Select Ikko Trader Visa as your withdrawal method. Your profits will then be credited to your credit card. Withdrawals may take up to 5 working days to be processed upon sending a request. Ikko Trader assures that your financial details are protected thru the use of our advanced encryption technology. Rest assured that your card details and personal information will not be passed to any third party.